Important details about our upcoming first token sale. UPDATE 26 OCTOBER, 2017: Final Pricing of Simple Token Announced. NB 1: I’ve titled this post as “part I” as I’m certain we’ll be issuing updates as we hit milestones and get closer to the token sale date. I’m also certain that I’ve missed out on some points, please let me know. NB 2: For those of you who are itching to press control F and skip right down to the details on the token sale, I encourage you to do the long read. Simple Token [ST] is a utility token. Please learn and inform yourself about the utility of ST and purchase ST if you intend to make use of that utility. Please also note: The absolute best place to get the most real-time up-to-date info and to chat with me and our team is always in our Telegram channel. I’m in our Telegram non-stop, as is every member of our team. Chat with us. Engage with us. Challenge us. Our intent is to be as transparent as possible so please ask us any and all follow-up questions in our Telegram. SIGNIFICANT MILESTONES IN SIGHT. MUCH, MUCH MORE TO DO. Launch of Simple Token and generation of the first Simple Token-powered “Branded Tokens” [BT] via our token generation event on 14 November, 2017. Our fearless (and exhausted) team is thrilled in anticipation of these two milestones as they mark major proof points along our journey. At the same time, we are cognizant that this is still very much the beginning stages of our journey and that the hardest work is well ahead of us. We also know that it will take a supportive team and community and ecosystem to make this project successful, and we are committed to remaining humble and open and transparent as we attempt to earn and deserve and retain support. The state of Blockchain technology today is like year 1993 Internet (albeit with year 2000-like internet hype); Simple Token and projects like ours are planting seeds, building infrastructure, and developing platforms that will take many years of tremendous vision, effort, tenacity, and execution to deliver on the promise. 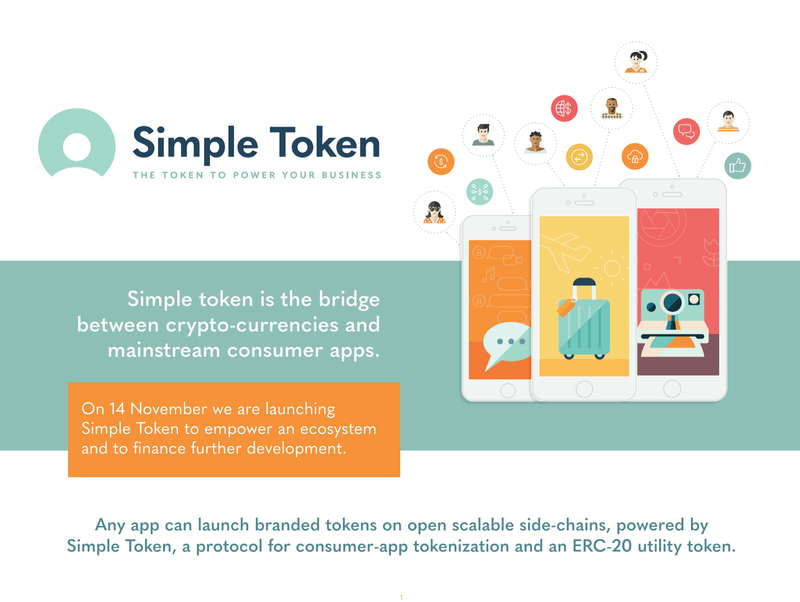 Simple Token is a protocol and software suite for consumer app tokenization. The business and technical challenge we set out to solve is to enable mainstream applications to benefit from deploying their own branded crypto-backed token economies, in a scalable and cryptographically auditable manner, without needing to mint and maintain their own publicly-tradable crypto tokens. This project began with our attempt in 2016 and into early 2017 to develop a token economy for one app, Pepo, and our realization that rather than building tokenization technology for one app, the much more important, interesting, and worthy challenge was to build the enabling technology for any app to tokenize and benefit from having parts of their business on a blockchain. We want to enable any business to launch their own branded crypto-based economy without the legal, regulatory, and technology headaches involved with going alone. This could enable them to monetize user contributions and content, power peer-to-peer transaction, provide meaningful incentives and rewards, develop transparent loyalty programs, and unleash thousands of new monetization and supply / demand possibilities. The OpenST protocol, powered by our ERC20 token “ST,” enables any company to stake ST on Ethereum main-net to mint their own branded digital currency (aka “tokens”) on open scalable side blockchains, in a crypto-graphically auditable manner. The Simple Token software, built on OpenST, helps companies launch and manage their ST-powered token economies. It’s a SaaS software package, a dashboard, a set of tools, for managing a token economy. OpenST is infrastructure. Simple Token software is middleware. Together they provide an easy on-ramp for consumer app tokenization. This 20 minute overview video from a talk we gave in Hong Kong. This plain English blog post about the project. The 58 page project deck / white paper. The OpenST technical white paper. A series of side-papers about topics such as ST utility, ST demand economics, governance, and more. A long (90 minute) video interview Jason Calacanis did with me about the back story behind Simple Token. Our team has been hard at work to demonstrate and prove usable utility of OpenST by mid November. This has been a critical milestone for us as we are 100% committed to ST being a utility and to proving that utility at the time of our token sale event, and especially before tokens are distributed (which we aim to do immediately at the conclusion of the sale). The OpenST protocol enables the creation of utility tokens on a utility blockchain while the value of those tokens is fully backed by staked crypto-assets on a value blockchain. On November 7, 2017 we will publish a proof of the utility and usage of OpenST. This will be published in form of github posts and demonstration videos with a live consumer application, Pepo. The first milestone will achieve minimal viable utility (MVU), which we define with the following four user stories. First, a partner company should be able to stake Simple Token on Ethereum mainnet (the value blockchain) via smart contracts in order to mint its branded tokens on a utility chain, also via smart contracts. For purposes of the MVU, the validator pool of the utility chain will consist of the OpenST Foundation, the Simple Token Company, and Pepo. Each validator will have Simple Token staked on Ethereum that can be slashed upon failing to correctly validate the utility chain. Second, a user should be able to purchase branded tokens of that partner company, either directly or via a service (for the MVU, we have built a PayPal integration). Third, a user should be able to pay another user in those branded tokens within the partner company’s application. Finally, a user should be able to cash out (i.e., exchange her branded tokens for Simple Token). We have achieved an end-to-end initial implementation of these users stories on internal testnets; the next steps are to put more meat on the bones of this framework and to deploy to Ethereum testnet. NOTE: Each validator will have Simple Token staked on Ethereum that can be slashed upon failing to correctly validate the utility chain. As we onboard partner companies they join the validator pool for each utility chain. After milestone 2 we will open up the validator pool for anyone to stake Simple Token to validate on a utility chain. The MVU, which blockchain developers can use right away and expand on, is an important step in the utility of Simple Token, but our ambitions are much greater. We defined the OpenST protocol in a manner that utility chains are first directly anchored into Ethereum. The protocol is agnostic to the underlying scaling technology and we can build on Casper, Cosmos, Polkadot and Plasma to scale the OpenST platform. We want to evolve the OpenST protocol with the broader Ethereum development and scalability projects and even some day move off of side chains and onto public Ethereum or other platforms that have yet to emerge. Identity as a service so that individual users don’t cheat and hoard Branded Tokens. User friendly wallets, which requires that we can both onboard users who know nothing about cryptography and private keys and at the same time satisfy the Your-Key-Your-Coin cornerstone of crypto-economics. To achieve this we provide the steps to guide users on a path to allowing them to control their own keys with Simple Token standalone wallet or integrations into existing wallets. Within consumer applications we onboard new users with “managed keys”. These managed keys are never known by the partner company (or us). Rather we deterministically reconstruct the users’ private key to sign on the client side in the application (on the phone or in the browser). Even then we understand that this is a controversial topic; and we have a big responsibility as we look to onboard millions of new users onto cryptographically secured back-ends. The OpenST protocol therefore provides the ability for the user to always exit from the managed keys with a standalone wallet. . Enabling Partner Companies to offer carious transaction types such as peer to peer, subscriptions, B2C, B2B, API-based, user-unlocked rewards, and more. Fraud checks and early-warning systems. Interoperability, so that consumers can earn tokens in one part of the ecosystem and spend them in another, without the user having to manually convert them to execute a transaction. Our first Simple Token generation event will be on 14 November, 2017. As I’m going to list a lot of details below, I strongly encourage you to refer to our Telegram channel with any questions, real-time updates, and/or for any details I missed below. The ST token generation event is required for two purposes. Because ST is needed in order to stake against creating BT, therefor we need to first create ST and have some value placed on it by purchasers of ST. So that we can create an endowment for the community ecosystem. 27.2% of the ST token supply is being reserved for what we call the Network Accelerator Program. This will be used by the OpenST Foundation to seed projects, developers, and teams that are building interesting use cases based on ST. In this manner we become a seed program/accelerator for a new generation of apps launching branded token economies. All purchasers in the token sale will be able to reserve their unique Branded Token name during purchase on the Simple Token website. This is included in the purchase price. Branded Token name reservations will be on a first-come-first-reserved basis, only upon KYC/AML check, and upon completing purchase. This is a reservation only: Deploying branded tokens is still subject to approval from the Foundation and such approval will include trademark checks, copy-write infringement checks, and suitability requirements. 800,000,000 Simple Tokens will be created. This is a finite supply, it can never be increased. As noted above, 27.2% of the token supply reserved as grants for promising projects (and their teams) building branded economies on Simple Token, for developer bounties for furthering the OpenST protocol, and for other relevant user or organizational contributions to the ecosystem. 5% to 17.2% of the token supply locked in a smart contact for a minimum of 6 months from the initial token sale, for possible future token sales. (The exact amount will depends on bonuses provided in pre-sales, as further described below). Purchasers in Token Sale #1 get automatic 20% discount on Token Sale 2. 5.6% for early backers, with a long term vesting schedule. (Supported the project financially since early 2016, and allowed me to work on it full-time this year and now 20+ team members on the project. These are firms such as Tencent, Greycroft, Vectr, 500 Startups. As listed on our website.). 3 year linear vesting from beginning of involvement with the project. 10% for advisors, with a vesting schedule. 2 year linear vesting from beginning of involvement with the project. 10% for the founding team, with a vesting schedule from beginning of involvement with the project. 3 year linear vesting, except for myself who is on 4 years linear vesting. We are currently in pre-sale on the token sale and it is well subscribed. A soft milestone actually occurred on Monday this week as the first pre-sale purchasers completed their purchases. (THANKS! early backers!) (I’ve raised a healthy amount of equity financing in my day, it’s quite a different feeling to see crypto hit the wallet). The pre-sale is limited to accredited buyers from allowed countries, purchasing at least $200K in Simple Token. U.N. Sanctioned countries and Chinese residents are prohibited. The pre-sale bonuses mean that someone who purchases say $1M in Simple Tokens in the pre-sale gets $1.3M worth of tokens when they are distributed. The bonuses are in exchange for funding immediately, and for agreement with a 12 month linear release schedule. 1/12th of the pre-sale purchasers’ tokens are released to them each month following the closing of the public sale. Kenetic based in Hong Kong is our lead advisor and partner since July 2017. Kryptonite 1 has been helping us for many months now. To learn more about the pre-sale and purchaser bonuses, please reach out to our team at presale@simpletoken.org! The price is $0.0833 per ST.
All purchases must be done in ETH. The ETH price will be locked and set 3 days prior to the token sale, as same for all purchasers. We will provide exact instructions in the coming days but DO NOT send ETH to any other address than the one we provide you directly once logged-in on our website. Also, we will never send you an ETH address by email. All potential purchasers must create an account with OpenST (only at the website https://simpletoken.org), and complete mandatory Know Your Customer (KYC) and Anti Money Laundering (AML) checks in order to be considered for purchase. Individuals from or residing in U.N. sanctioned countries and/or residing in China will not be allowed to purchase. In order to be eligible to purchase during the Early Access, the potential purchaser must (A) register with OpenST at https//simpletoken.org during the “Early Access Registration period” between 1–13 November, 2017, and be approved by OpenST under its KYC/AML compliance policies and procedures by 14 November, 2017. To reiterate, the early access/whitelist period OPENS on 1 November, 2017 and ends on 13 November, 2017 and to get notified first, you must join our Telegram. There will be a cap/maximum purchase amount on the Early Access day to help ensure that as many people as possible can make a purchase. Approved purchasers will be notified by email from tokensale@simpletoken.org and should ignore any emails from any other address regarding the OpenST sale. Registered Simple Token account holders can also check their approval status by logging into their account at https://simpletoken.org. Potential purchasers who register after 13 November, 2017, and who are approved as purchasers by OpenST under its KYC/AML compliance policies and procedures, may be entitled to purchase during the General Access period starting on 15 November and ending at latest on 1 December, 2017. However, the General Access sale may not occur if the OpenST token sale achieves the hard cap of $20M during the Early Access period. There is no cap/maximum per person from 15 to 1 December, and persons who purchased during the Early Access period can also purchase more during the 15–1 period if it happens. In other words, if you want have the best shot of getting in, make sure to register and get approved for the Early Access day. The Token Sale consists primarily of three smart contracts: SimpleToken, an ERC20-compliant token; TokenSale, the contract that will govern the sale; and Trustee, the contract that will govern the vesting of pre-sales and grant allocations. Additionally, there are two auxiliary smart contracts: FutureTokenSaleLockBox, which locks tokens earmarked for a future sale from transfer for at least six months after this sale; and ProcessableAllocations, which will ease the administrative burden of processing monthly vesting allocations by the OpenST Foundation. The token sale contracts have been written with diligent security management in mind and have strong test coverage. Bok Consulting, and Cure53 are currently auditing our token sale contracts, and Zeppelin Solutions will also be auditing. We are additionally considering issuing bug bounties. All of our token sale contracts are available to the public at https://github.com/OpenSTFoundation/SimpleTokenSale. How is the ETH being used that is collected from people purchasing the tokens? As much as possible on product development and ecosystem development. In our project deck / white paper we outline a use of funds allocation of: 50% product development, 10% network development, 10% legal, 10% overhead, 10% security, 5% accounting, and 5% administration. We are developing and will publish a robust governance model and a transparency model. Some of this is already presented on our website. We will publish further and more fuller details ahead of the token sale and we expect the community to hold us accountable to it. Is Simple Token a utility token or a security? Simple Token [ST] is a utility token, and not a security. This viewpoint is supported by legal opinions from top law firms in 9 major jurisdictions including Hong Kong and the United States. ST is required in order to utilize the OpenST protocol, which enables ST to be staked against creating Branded Tokens [BT] on open scalable side blockchains in a cryptographically auditable manner. In order to launch BT, Member Companies must acquire ST, and stake ST against the minting of their BT. In addition, Member Companies will be required to stake and risk an amount of ST against their acting as good actors in the ecosystem. ST will have many other uses in the OpenST and Simple Token network, for example holders of ST can act as independent validators of other actors in the network, and to earn ST for providing such validation. ST is also required in order to use the Simple Token software. Why should I purchase Simple Tokens? To create Branded Tokens [BT] powered by Simple Tokens. What cryptocurrencies will be accepted during sale? We will be accepting Ethereum (ETH) during the public sale. Is registration required to purchase? Is KYC/AML required to purchase? What’s your take on increased regulations around ICO’s? We are committed to a fully-compliant token sale — indeed, Simple Token favors increased regulations for token sales and for digital assets including cryptocurrencies. In fact, we believe that many companies considering token sales would be better advised to launch their branded tokens on Simple Token powered side-chains using Simple Token protocols instead of attempting their own token sale. With the assistance of a global team of professional advisors, including legal, Simple Token has been designed from the ground-up to be a product and utility token. Our position is that it is not a security. We embrace regulation, understanding its purpose of ultimately protecting potential token purchasers and the industry as a whole. It will also serve to assist in deterring scams and ill-developed projects. Our top priority is ensuring Simple Token is fully compliant with any/all regulation that comes down the pipeline. We’ve partnered with the leading professional advisors in the world including Smith & Crown, Perkins Coie, King & Wood Mallesons and PwC. We are committed to ensuring that Simple Token is fully compliant with all regulatory requirements. What wallet can I use to participate in Simple Token’s public sale? When you participate in the public token sale, you must make payment from a Wallet for which you control the private key. If you direct payment through a cryptocurrency exchange or hosted wallet, the Smart Contract will return any Tokens to that wallet’s address. If that occurs, you may not in fact receive any Tokens and the Foundation is under no obligation to return your payment or its equivalent in value or to send additional Tokens in such circumstances. You should use a token compatible Ethereum wallet that does not automatically generate a new address for every transaction. More FAQ can also be found here on our website.